Team USA's women swept both the individual and team medals in Moedling. Photo Credit: Margaret Lu. Men's foil individual medalists Jung Heng Liao (bronze), Eric Yu (bronze), Draper Dayton (gold) and James Chen (silver). Photo Credit: Dean Hinton. 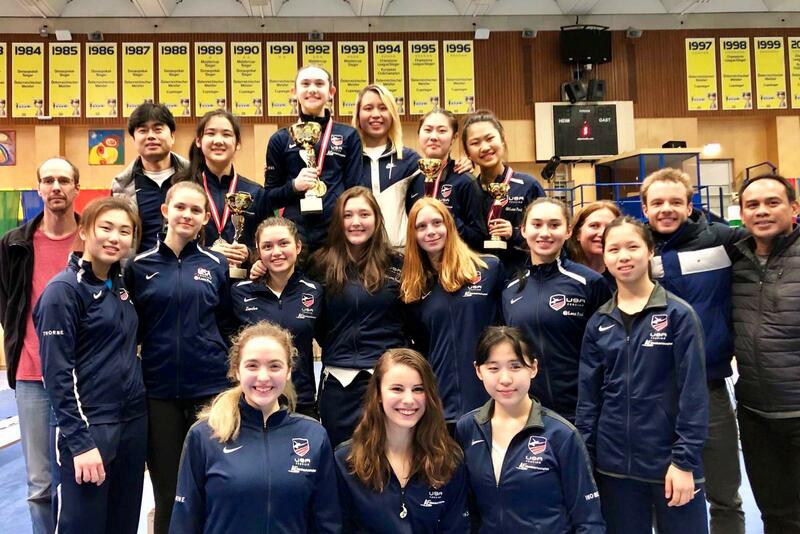 (Colorado Springs, Colo.) – The U.S. foil squads dominated the field at the Moedling Foil Cadet European Cup in Austria this weekend, winning all eight individual medals and five of six possible team medals. Team USA showed its roster depth in the individual events, earning 14 of the top 16 positions in the women’s event and 11 of the top 16 men’s placings in one of the program’s best results in the history of the circuit. In the women’s event, Maia Weintraub (Philadelphia, Pa.) and Alicia Hao (Acton, Mass.) won gold and silver with Yejine Lee (Northvale, N.J.) and Helen Tan (Coppell, Texas) taking both bronzes. Draper Dayton (San Francisco, Calif.) won the men’s gold with James Chen (New York City, N.Y.) earning silver and Jun Heng Liao (Basking Ridge, N.J.) and Eric Yu (Encino, Calif.) earning bronze. Fencing in the women’s individual event on Sunday, Weintraub, a two-time gold medalist on the national circuit this year, moved up to No. 2 in the Cadet European Standings with her first Cadet European Cup title win. Seeded ninth after an undefeated pool result, 16-year-old Weintraub defeated Rachika Yoshimori (NED), 15-5, in the table of 64 and Katina Proestakis (CHI), 15-11, in the table of 32. After a 15-10 win over Jekaterina Solodkiha (LAT) in the 16, Weintraub defeated 15-year-old Zander Rhodes (South Orange, N.J.), the gold medalist at the Manchester Cadet European Circuit event in September, by a score of 15-12. All three of Weintraub’s fellow medalists also were top-eight finishers at the Manchester tournament with Hao winning bronze and Lee and Tan each advancing to the quarter-finals. Sixteen-year-old Hao cruised through her first three DE bouts, scoring the day’s only 15-1 win in her table of 128 bout against Jingxuan Chen (SIN) and defeating Xenia Maul (GER) and Miriam Schreiber (SWE) by 15-8 and 15-6 scores, respectively. Hao held on for a 14-12 win over Luca Holland-Cunz (GER) in the 16 and defeated 16-year-old Gabriella Ahn (New York City, N.Y.), 15-11, to secure a berth to the semis and her second career international podium finish. Sixteen-year-old Lee won her table of 64 bout against Julia Mae Hui Min Wong (SIN), 15-7, to set up four straight bouts against her U.S. teammates. Lee edged 16-year-old Elisha Tan (San Diego, Calif.), 15-13, in the 32 and 15-year-old Catherine Flanagan (Pleasantville, N.Y.), 15-6, to qualify for the quarter-finals where she defeated 16-year-old Sara Martos (El Cerrito, Calif.), 15-11. Helen Tan left a string of opponents in her wake as the 16 year old held each of them to single-digit scores en route to qualifying for her first semifinal on the circuit. In the semifinals, Weintraub defeated Tan, 15-9, and Hao won her bout over Lee, 15-10. Weintraub took on Hao in the finals, winning the gold by a 15-12 score. In the newly released Cadet National Point Team Standings, the race for one of three positions on the 2019 Cadet World Team remains tight with 2018 Junior World bronze medalist Lauren Scruggs (Ozone Park, N.Y.) remaining in first with Weintraub, Rhodes and Helen Tan within 200 points of each other in the second through fourth positions. Hao climbed to seventh with Lee in ninth. Fencing in his first Cadet European Cup event in two years, 16-year-old Dayton made a statement in Moedling on Saturday, letting just one of his first six opponents get to double digits. Dayton gave up just two touches in each of his first two rounds, defeating Mykhailo Bodnar (UKR) and Janko Leskovac (CRO) by 15-2 and 12-2 scores, respectively, before besting 2018 Y14 National Champion Andrew Chung (San Diego, Calif.), 15-7, in the 32. Dayton’s closest challenger of the day would be Chase Emmer (Morristown, N.J.) who won silver at the Junior Olympic Fencing Championships in February as a 13 year old and earned Division I bronze at the October North American Cup. Emmer came within three of defeating Dayton who took the bout, 15-12. In the quarter-finals, Dayton shut out 16-year-old David Tierney (Naples, Fla.), 15-0, to secure a podium finish. Chen controlled his opening bout against Koen Walet (NED) for a 15-3 win and narrowly escaped the 64 with a 15-14 win over Laurenz Rieger (GER). The 15 year old won his next two bouts by 15-11 scores, defeating Hendrik Dion Lenk (GER) and Adam Podralski (POL) before edging top-ranked U.S. cadet fencer Lucas Lutar (Brewster, N.Y.), 15-14, to advance to the semis. Fifteen-year-old Yu set the tone for the day early, taking the No. 1 seed out of pools and giving up no more than five touches to any of his first three opponents, defeating Jakub Surma (POL) and Ethan Paz (AUS) by 15-5 scores and advancing to the 16 with a 15-4 win over Mateusz Biedrzycki (POL). Yu won his next two bouts to qualify for the semis against American opponents, defeating 16-year-olds Clayton Reid (Pacifica, Calif.), 15-11, and Oliver Hu (Lexington, Mass. ), 15-8. 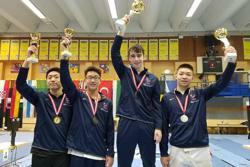 Although Moedling was the first cadet designated international event of the season for the men’s foil squad, 16-year-old Liao earned a top-eight at the undesignated tournament in Manchester last month and was determined to reach the podium in Moedling. Liao controlled each of his opening bouts, defeating Jakub Smuda (POL), 15-8, in the 128 and besting Leopold Marc Kuchta (GER) and Jonathan Tzien Yih Lim (SIN) each by 15-5 scores. Liao pulled out close wins in his next two rounds to qualify for the semis, defeating David Liebscher (GER), 15-13, and 16-year-old Bryce Louie (Los Angeles, Calif.), the No. 5 fencer in the Cadet National Point Standings, by a single touch at 15-14. With podium finishes secured, Dayton won his semifinal bout against Liao, 15-9, and Chen defeated Yu, 15-8. In the finals, however, Chen medically withdrew, ending with a silver medal and giving Dayton the gold. The results from Moedling caused some shuffling in the Rolling Points which have no returning Cadet World Team members in contention for the 2019 squad. Yu moved up from No. 6 to No. 5 with his bronze medal finish and Chen’s silver moved him from No. 8 to No. 6. Liao sits in seventh and Dayton’s gold caused the greatest jump as he moved from No. 37 to No. 15. Lutar remains in No. 1 and Emmer climbed from No. 3 to No. 2. Reid moved from No. 4 to No. 3 and Louie shifted from No. 5 to No. 4. USA 1 defeated Germany 4, 45-15, in the table of 32. In addition to anchoring, Rhodes also led the team in scoring, posting a +14 indicator as Lam and Tan added +8 each. Fencing Ukraine in the 16, Rhodes went +14 again, giving up just one touch in her three bouts. Overall, the Americans won seven of nine bouts as Tan finished +6 and Lam finished +5 to combine for a 45-20 win. USA 3 led the quarter-finals, 20-9, after the first four bouts, but Rhodes changed the momentum, outscoring Ferrari, 11-5, in the fifth. Lam defeated Horsley, 7-2, to tie the score at 27 and the trio of Cho, Lam and Rhodes outscored their opponents, 18-13, in the final three bouts to win the match, 45-40. Juliana Hung (San Francisco Calif.) and Annora Lee (New York City, N.Y.) joined Chusid and Elisha Tan to make up the USA 4 squad that advanced to the semis against USA 1. USA 4 tied two bouts at five, but were unable to earn the win with USA 1 earning the win, 45-32. In the other semi match, the USA 2 team of Yejine Lee, Koo, Ahn and Maria Stamos (New York City, N.Y.) dominated Austria 1, 45-15, winning all nine bouts. Koo, the squad’s anchor, and Stamos each posted +11 indicators with Stamos finishing at +9. In the finals, USA 1 dropped just one bout, but USA 2 posted a trio of five-touch ties to stay in the hunt. In the end, however, USA 1 took the match, 45-40. USA 4 rounded out the All-American podium finish with a 45-29 win over Austria 1. Annora Lee anchored the squad which won seven of nine bouts as Lee, Hung and Chusid each posted positive indicators. In the men’s team event on Sunday, it would be USA 3 that would take gold. The squad included Liao and Hu as well as Fyze Tulyag (Fresno, Calif.) and John Griffin (Sugar Land, Texas). With Griffin as anchor, USA 3 blew through its table of 64 match against Austria, taking a 45-12 win. Liao led the squad in scoring with a +13 indicator with Tulyag adding +12 and Griffin posting +8. In the table of 32, USA 3 bested top-seeded Italy, winning or tying six of the nine bouts as Liao anchored the squad to a 45-36 victory. USA 3 wouldn’t let its next opponent get close, winning or tying all nine bouts against Germany 3, including three shutouts. Griffin earned a +14 indicator with Liao ending at +9 and Hu at +7 for a 45-15 win. In the quarter-finals, USA 3 took on a USA 1 team that included Emmer, Lutar, Reid and Zach Binder (Armonk, N.Y.) USA 3 built a seven-touch lead at 25-18 after the fifth and didn’t turn back. Liao took on Lutar in the anchor bout and held off the top-ranked fencer’s late charge to close the match for USA 3 at 45-42. The semis pitted USA 3 against a tough Germany 2 squad; however the Americans held a 12-touch lead at 30-18 after the sixth that the Germans couldn’t match. USA 3 dropped just one bout of nine and ended with a 45-39 victory. In the second semi, the USA 2 squad of Yu, Chung and Louie faced Germany 1 with Louie posting a key win in the sixth at 10-3 over Noah Braun to put Team USA in the lead at 30-28 for the first time in the match. The trio closed strong to win the match, 45-42, and advance to the finals. The final match would see Griffin as USA 3’s standout fencer, posting a +8 indicator. Although USA 2 won three bouts, USA 3 held off their opponents for a 45-40 win.